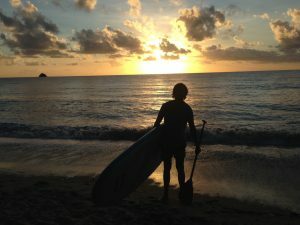 Here at Pacific Watersports, it is our honour and privilege to offer you watersports in Palm Cove. We are obsessed with getting out on the water ourselves because we know how great it makes us feel, and we want you all to experience it too! Whether you come on a kayaking tour, take a kitesurfing lesson or try paddleboarding, we will help you to have fun on the water. 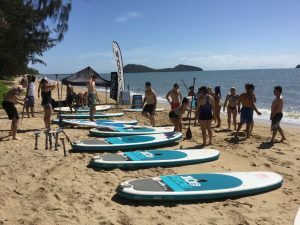 Watersports in Palm Cove- What do we offer? We offer 4 awesome watersports experiences in Palm Cove. Whether you are here on holiday or are a local looking for adventure, we’ve got you covered! That’s right, TURTLE tour! On this Kayak tour, we head out to Double Island and look for Turtles. There are many Green Turtles and Hawksbill Turtles hanging out around the coral reef just to the south of the island. As we cruise over the reef on our kayaks, we look down through the clear blue shallow water and count the turtles as they pass underneath us. Sometimes they pop their heads up to take a breath too! 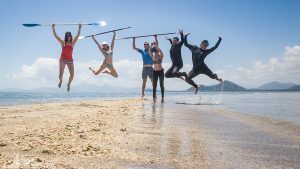 This is an incredible experience for the whole family and one of our most popular watersports in Palm Cove. Double Island is just a short paddle from our base at the South end of Palm Cove beach. After we have paddled over the reef, we go around the island, stopping on a beautiful secluded beach for drinks and snacks and a quick dip. We then enter Double Islands secret cave, before heading back to the mainland. Perfect for those that want to be out on the water for half a day. 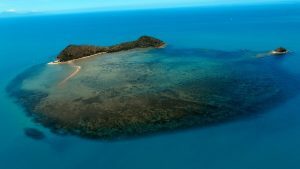 We don’t just have Double Island within arms reach of Palm Cove… We also have Haycock Island (aka Scouts Hat). Scout’s Hat is Double Island’s little brother and just sits slightly to the north of Double Island. On our Island Hopping Tour, we do everything that you do on a Kayak Turtle Tour (above) AND we explore Scout’s hat by foot, spend time snorkelling around the islands and have a relaxing lunch over on the islands (provided). Perfect watersports in Palm Cove for those that want to be out on the water for the whole day! Perfect for those who want to try adrenaline fuelled watersports in Palm Cove! Learn to fly with us! We will teach you how to become independent and confident riders here in paradise Palm Cove. 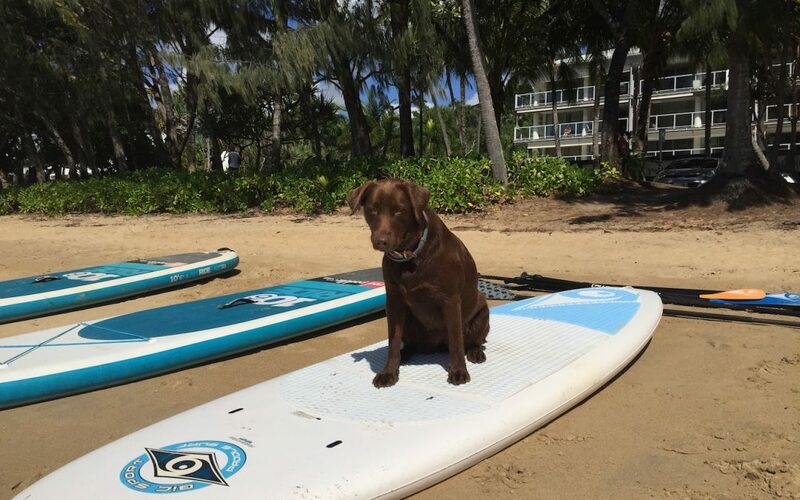 We take our lessons in 3 different locations, Yorkeys Knob, Palm Cove and Double Island. 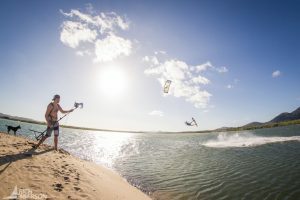 The Kiteboarding community in Palm Cove is awesome! If you are a local that has wanted to learn for a while, the support network available here will really help you to get comfortable with this sport quickly. Paddleboarding is the perfect activity for the whole family. 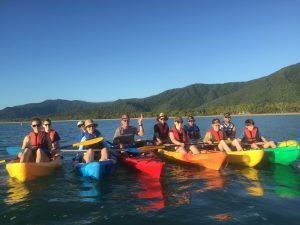 Whether you come on one of our Kuranda Rainforest Paddleboarding Tours, or just take a paddleboarding lesson at the beach, you are sure to have an awesome time. It doesn’t take long before everyone gets the hang of this awesome watersport activity. 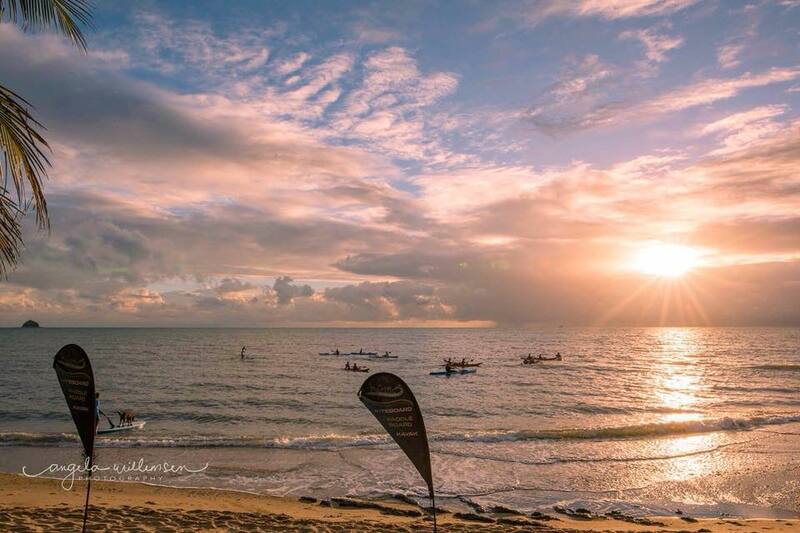 We hope to see you soon trying some watersports in Palm Cove! Top 3 Cairns Adventures Not To Be Missed! Want to add some Cairns Adventures to your Bucket List? Cairns, Far North Queensland is an incredible part of the world. There is so much to do here, which is why so many people return here for their holidays time and time again. The tropical climate of the Cairns area means we all spend a lot of time outdoors and Cairns Adventures are usually part of everybody’s experience in Far North Queensland. Join us for a morning kayak adventure to the magnificent Double Island. Double Island is situated just 1km from the coast of Palm Cove. Our Kayak Tours leave Palm Cove daily at 7 am (click here to book a spot!) and return at around 10.30 am. On our Kayak Turtle Tour, we paddle over to Double Island on our Kayaks (25-minute paddle) as a group. To the south side of the island is some amazing coral reef, so we slow it down a bit here to look for some of the green turtles and hawksbill turtles that feed here. We often see other marine wildlife too, including rays, reef sharks and a variety of different tropical fish. We then continue our paddle around the back of the island, pulling up on a pristine and secluded tropical beach for some drinks and snacks (provided by us). On our way back to the mainland we explore Double Islands secret cave and have plenty of time for taking great pictures. This is one of the Cairns adventures not to be missed! Another morning kayaking adventure not to be missed! On our Island Hopping Tour, we leave Palm Cove daily at 8 am and return at 1.30 pm. 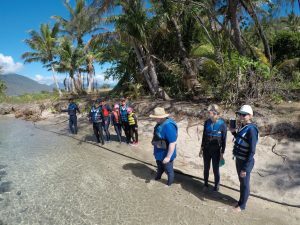 In this tour, we explore double Island and the surrounding reef in much the same way as the Double Island Kayak Turtle Tour, but we also explore Haycock Island. Haycock island is the small island that sits just to the south of Double Island. Within this tour, we have more time for snorkelling over the reef, as well as exploring Haycock island by foot. A perfect Cairns Adventure for the whole family! Exploring tropical islands… what is not to love? Click here to find out more and book your spot. Visiting the rainforest is a must when you are visiting Cairns. Another of our Cairns Adventures not to be missed! Join us on a rainforest Paddleboarding adventure. This tour usually operates in the afternoon (from around 2pm-5pm) and pick up is available from anywhere in Cairns should you need it. We start the tour with an introduction to paddleboarding on the river bank, before jumping on our sups and cruising downstream. The rivers gentle current carries us down, with minimal effort needed! We travel down the river, observing the beautiful rainforest all around us. This tour really is suitable for the whole family, from kids to seniors. Click here to find out more and to book your spot! Any questions? Contact us and ask away! Palm Cove is one of Cairns’ Northern Beaches and is arguably the most beautiful. Many people come to Palm Cove to escape the cooler winter months down South, as being in the tropics, we have warm weather all year round. And what do you do when you find yourself holidaying in a paradise beach town? Water Sports of course! Here at Pacific Water Sports, we have been providing Palm Cove Watersports to locals and visitors since 2012. Water Sports are our passion. When we aren’t working in the water by providing awesome beach activities, teaching kite surfing and running tours to Double Island and the Rainforest, we are playing in the water ourselves! 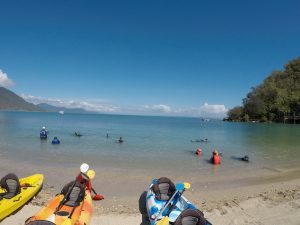 What Palm Cove Watersports do we offer? We have 2 awesome kayak tours running daily in Palm Cove, our Double Island Kayak Turtle Tour and our Island Hopping Tour. Our Double Island Tour leaves at 7 am and we return back to Palm Cove Beach at 10.30am. During the tour, we cruise over to Double Island on our kayaks (it takes about 25 minutes of paddling). Just in front of Double Island is a beautiful coral reef. As we paddle over the reef, we look for turtles and other marine life (reef sharks, rays and dolphins are some of the animals we see!). We then paddle around the back of Double Island and have some snacks (provided by us) on a beautiful secluded beach. After our rest, we explore Double Island’s secret cave- also on our kayaks! After a beautiful morning exploring this incredible island, we paddle back to Palm Cove. Our Island Hopping Tour leaves at 8 am and returns at 1 pm. This tour is perfect for those who want to stay out on the water a little bit longer, and see more of Double Island AND explore Haycock Island (the small Island next to Double Island) AND have more time to snorkel and relax. On this tour, we do everything that we do on the Kayak Turtle Tour (see above) but we have some time to snorkel over the Islands surrounding Reefs. The reef is truly amazing and you can swim with many tropical fish and sea turtles. We also pull up on Haycock Island – affectionately named ‘Scout’s Hat’ due to the way it looks!- and walk around the whole island. Lunch is provided on this incredible Kayak Tour. 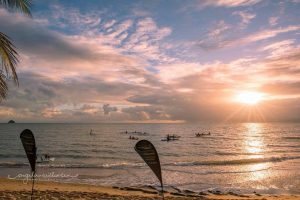 You must try these Palm Cove Watersports if you are visiting the area! The perfect activity for when you are having a ‘beach day’. In between ice creams and beach naps, why not come and see us for a paddle boarding lesson? A signature of the Palm Cove Water Sports, paddle boarding is a perfect activity for the whole family. We can run one on one paddle boarding lessons, or group lessons. Get in touch with us to book a spot. We would recommend trying a sunrise lesson- watching the sunrise over the sea is such a beautiful way to start the day. 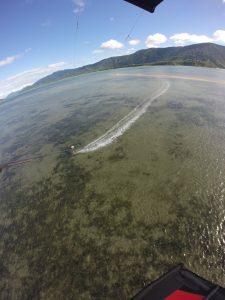 Another amazing Palm Cove Watersport to try- Kiteboarding! A great water sport to try whatever your age- we have taught 11-year-olds to 65-year-olds! So long as you have a sense of adventure and love getting out on the water, this sport is worth a try. 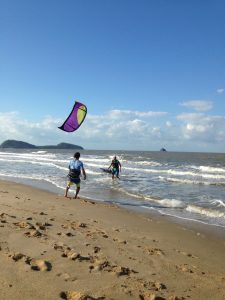 We teach Kite surfing at Palm Cove Beach, Yorkey’s Knob and Double Island. Although this water sport isn’t in Palm Cove, we offer to pick up from Palm Cove and will take you up to our amazing Rainforest river spot in Kuranda (it’s about a 40-minute drive). 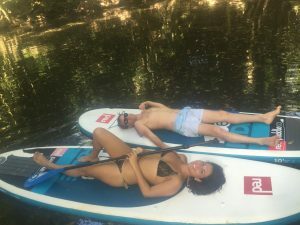 This Rainforest Paddleboarding Tour really is suitable for the whole family. We spend 2.5 hours on the water, cruising down the river, through the rainforest, on our paddle boards. The great thing about this water sport is everybody can do it. Whether you are 75 (yes we have had 75-year-olds on this tour) or 7, everybody feels comfortable with the pace of this incredible tour. Pick up is at 1 pm from Palm Cove and drop off back to Palm Cove is at around 5 pm. So come on down and try some Palm Cove Watersports with Pacific Watersports! Palm Cove is one of the top holiday destinations of Far North Queensland. And with its pristine palm-fringed beaches and clear waters, it’s easy to see why! In this article, we will share with you some of the best things to do in Palm Cove, whether you are a local seeking adventure, or visiting our tropical paradise. Here at Pacific Watersports, we offer an amazing tour for adults and children alike, to Double Island. 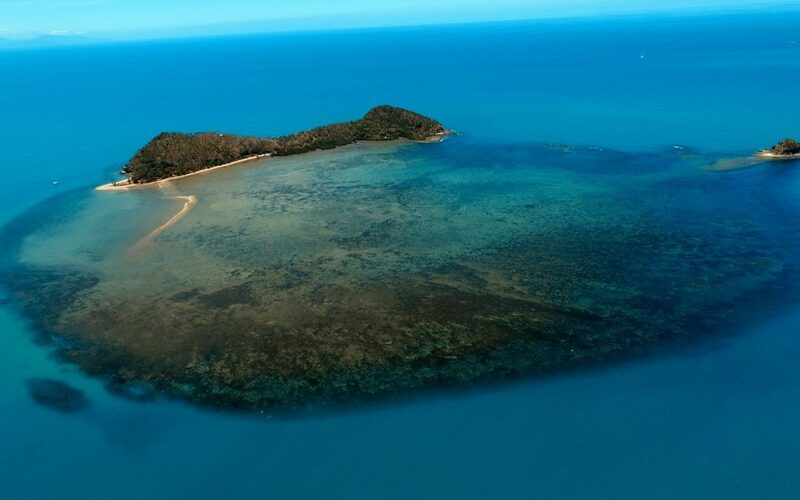 Double Island is a stunning tropical island 1km off the coast of Palm Cove. 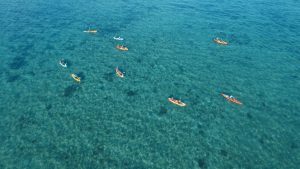 It’s a 25-minute paddle on our kayaks out to Haycock Reef- an amazing area of Coral Reef which sits to the south of Double Island. Here we slow down our paddle and observe the sea life through the clear waters below. We nearly always see Green Turtles or Hawksbill Turtles (see our Turtle blog for more info about these amazing creatures!) and often see small reef sharks, rays, all sorts of colourful fish and if you are really lucky… Dolphins!! The tour lasts for 3 and a half hours, departing Palm Cove at 7 am daily, and returning at around 10.30am. 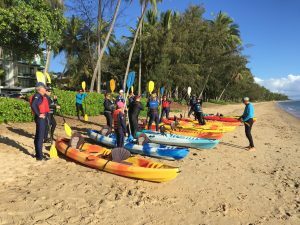 For more information, and to book a place at a Kayak Turtle Tour with Pacific Watersports, click here. Our Island Hopping Tour is the perfect tour for those that want to be out on the water a little longer! 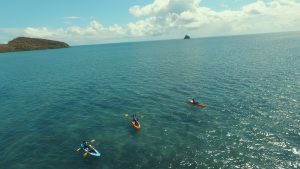 This is another Kayak Tour that we offer here at Pacific Watersports and is the perfect activity for those with a sense of adventure. Lasting 6 hours, on this tour we visit Haycock Island (a.k.a. Scout’s Hat- the small island next to Double Island) and explore its beaches and surrounding reef. We do some snorkelling, turtle spotting, explore the cave on Double Island and pull up on some of Double Island’s secluded beaches for a lunch break (lunch is provided). The Tour starts at 8 am daily, and we return to Palm Cove at around 2 pm. For more information and to book a place on an Island Hopping Tour, click here. Without a doubt, one of the most relaxing tours that you can do in the area. Our Rainforest Paddleboarding Tour is actually in Kuranda (about a 35-minute drive from Palm Cove into the Rainforest), but we pick everyone up in Palm Cove (or from anywhere in the Cairns Area). On this tour, we cruise down the Upper Barron River and through the Rainforest on our Paddleboards. This really is an activity suited to the whole family- we recently had a 75-year-old do the tour and really enjoy it! Suitable for all ages, from kids to the older generations. 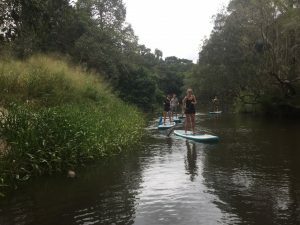 The smooth surface of the river makes it the perfect place to try Stand Up Paddleboarding for the first time and the tour is down-stream, meaning you don’t need to work too hard to get moving! Within this tour, we leave the main river and take a detour through a smaller river deep into the rainforest- a truly magical experience. We also stop on a sandy bank for snacks (fruit, cake and juice provided) and a swim in the river. If you are looking for things to do in Palm Cove that the whole family will enjoy and you haven’t been into the rainforest before- this is the tour for you! For more information and to book a place on a Rainforest Paddleboarding Tour, click here. 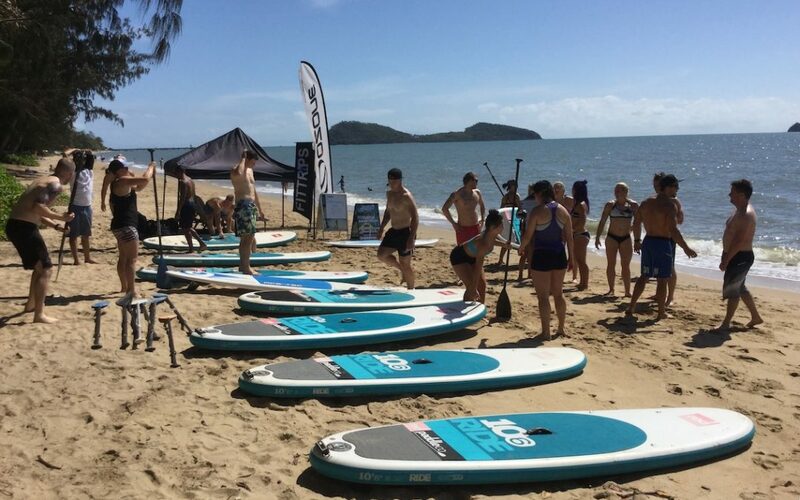 4) Paddleboarding Lessons in Palm Cove. If you fancy spending the day at the beach but want activities to do in between beach naps (!) why not come and try a Paddleboarding lesson with us at Pacific Watersports? You can find us (and our trailer) at the very South end of the Palm Cove Esplanade (opposite Jack and Shanans and Portofino restaurants). It’s usually best to book in for a lesson with us as it can get busy in the peak season, but you are also welcome to drop past and say Hi and see if we have a board available for you to play around on. 30 minute or 1-hour lessons are available. The perfect lazy day activity! Here in Palm Cove, we can get quite a lot of wind in the afternoons during our winter months (May-October). But this doesn’t have to mean that you need to retreat from the beach… Learn to Kitesurf instead!! 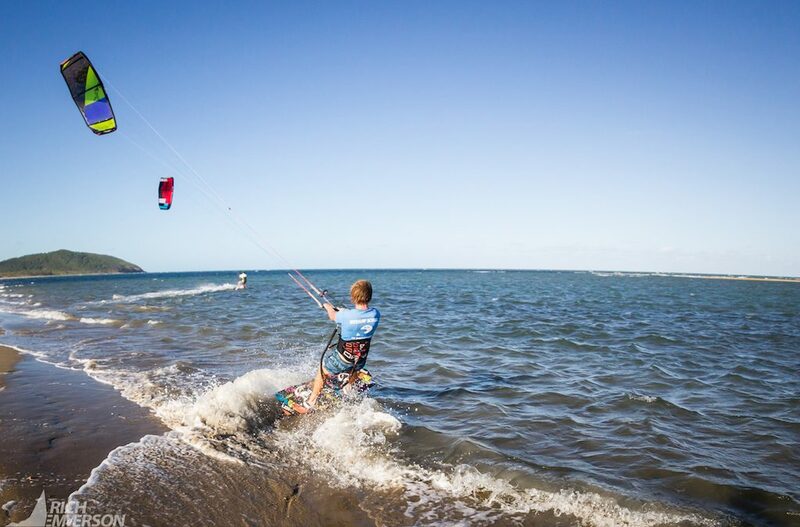 We offer Kitesurfing Lessons on Palm Cove Beach, at Yorkey’s Knob and at Double Island. The perfect activity for the adrenaline junkies in the family! The first lesson is usually on the beach, learning how to fly the kite safely and with good control. We then introduce the board and take your new kite skills onto the water! We usually recommend 2 or 3 lessons if you are really serious about learning the sport and becoming independent on the water. However, we also offer ‘taster’ lessons for those that want to see if this may be the sport for them, and group lessons if a few of your want to try Kitesurfing together. So if you are looking for things to do in Palm cove when it’s windy, this is a great option for you! For more information, and to book a Kitesurfing Lesson in Palm Cove, click here. Hartig Yoga offers amazing yoga classes, for all levels, on Palm Cove Beachfront. So if you are looking for things to do in Palm Cove in the mornings and early evenings, a beachfront yoga class may be right up your street. Hartig Yoga’s Beach classes are held at the south end of the Palm Cove Esplanade, on the grassy beachfront area in front of Alamanda resort and NUNU restaurant. The classes are multi-level, meaning everybody of every age, shape and fitness level is welcome to come- and is sure to get something out of it. Practising yoga on a paradise beach front, under swaying palm trees is a once in a lifetime opportunity, and a must try for tourists and locals alike. For more information and to book a place at a class, click here.